It looks really cool, such a great new to me technique! Will have to try it out! :-) thanks for sharing! I luv the sketch looks you've been making. A great technique! That's such a cool technique! Must add to my 'must try this asap' list! Thanks for inspiration, great card! Oh wow!!! What a beautiful card! Love this technique....perfect for this set! LOVE the sketch - it's gorgeous!!! Really nice card and it looks like it is inspiring all of us to give it a try! :) Thanks for sharing! Gorgeous! Looks like a pro hand sketched the gorgeous flowers - would never know it started with a stamp! Beautiful!! Looks like it's embroidered. Oh wow, it looks hand-drawn. Fabulous! Beautiful. Love the sketch look. Such a uniquely beautiful card! The sketch technique you used looks amazing! I love that it looks like you drew it by hand! Thanks so much for the inspiration! Such a beautiful card, Maureen! I love the soft pastels with the gray background...so unique, and really stunning effect! Love the look of this on that paper! Stunning! Beautiful card ! I love this technique, gonna give it a try ! Thanks for sharing ! That looks like a lot of fun! And it looks so natural! Thanks for the inspiration! oh great; another must have is that grey paper! love what you did with this stamp set and the chalky nature of it all! I love the Flourish stamp set. The gray card stock gives such a soft effect. Your sketch technique worked out beautifully! Love the look! The use if the colored pencils was lovely. I've never seen this technique with colored pencils before. It is beautiful! Wow! Beautiful card! Thanks for the inspiration! This is beautiful - what a different look. I can't wait to try this technique! I really must try this sketch look. You make it look so awesome!! I had to repost because I thought you used prisma but you used Luminance. This card looks completely hand done! Beautiful! TFS! Love the sketchy look ... very cool. Very neat idea for the sketch look! So soft and gentle. I love it. Thank you for providing such inspiration. Wow! I need to try this technique! Gorgeous card, love the kraft background! Aww, such a soft sweet pretty card! Love it! Thanks for sharing! Love this card, this is a interesting technique. Love the soft colors on your beautiful card! Gorgeous stamp set and an awesome cardmaking tool! Fabulous hop! So unique! Love the sketchy look! It looks hand drawn..so cool! I love that sketchy look you used. What a great set and such a beautiful card! TFS! Wow. What a gorgeous creation! So soft! What a fun way to use your pencils. Using the MISTI keeps all the details in exactly the right place but coloring over the lines with the pencils gives it a very distinctive look. Love it! Love your card....looks like a pencil sketch. Beautiful!! Never think to use colored cardstock to stamp on. Obviously, I've learned something new. The results are lovely. Very pretty! It looks like hand drawn art! Well done. I like the hand drawn look that you achieved. very sweet card like your colors!!! This is a wonderful look. Not sure I could recreate it but might want to try. Thanks. Oh Maureen, your card is so pretty. I love this stamp set! What a cool set of images and I love the beautiful card you made too. This is a great technique. I love the card, and will have to dig my colored pencils out to give it a go. Thanks for sharing and waking up my muse. I love this sketched technique! Before reading how you made your card, I would have said it was all pencils...how clever to use the Misti for your layering....really like the look!!! Your hard work is evident in this beautiful card. I have not seen this technique before. Thank you for sharing! Really like the looks of this card, I really like the technique. Want to learn to do something like this. Your sketched look was a success in my humble opinion. Love it! Love this sketchy look you gave to the new Concord and 9th set! Beautiful! Love how you gave this stamp set an entirely different look. Very lovely and looks like needlework with this technique! What a great technique! Beautiful card! Love your card! What a great technique. Wow!! I love the notebook edge you added - such a lovely touch to your nature inspired palette! Great alternate method - very nice! Beautiful card...the colors and light seeming to flow. Wow, a Mini MISTI would be super. Gorgeous! I love how it looks with the pencils. I love this card. It is my favorite. The coloring is awesome! Very interesting technique. It doesn't look as if any stamping was done at all. It really looks like a great sketch. Oh my goodness, I love this technique. It is so fun and sweet. Thank you for sharing. I may just step out of my box and try this sometime. I've never seen anyone do this with pencils before, what a fun technique!! I love my pencils so must give this a go, so thank you so much for sharing! Great technique! Thanks for the inspiration. Something new to try.... thank you. I love this look. It is a great technique to get more out of your stamps and works perfectly with this fabulous stamp set! What a fun technique! I'm going to have to try this soon. Your card is beautiful! I love how you used the pencils, what a great look! Inspired technique and design for the use of this stamp set. Great card!! Great technique. Going to try it out soon. Simply beautiful. I love the technique you used! Love the softened colors against the gray background and pencils. Just lovely! How beautiful! I really love this flower stamp set and the way you colored it! The Misti is the best tool ever ! Great looking card. The Misti has made making cards a lot less stressful. Sweet card, love the stamp set and your colouring. And thanks for all the tips and triks you have shared to use Misti. It's really a genial tool! 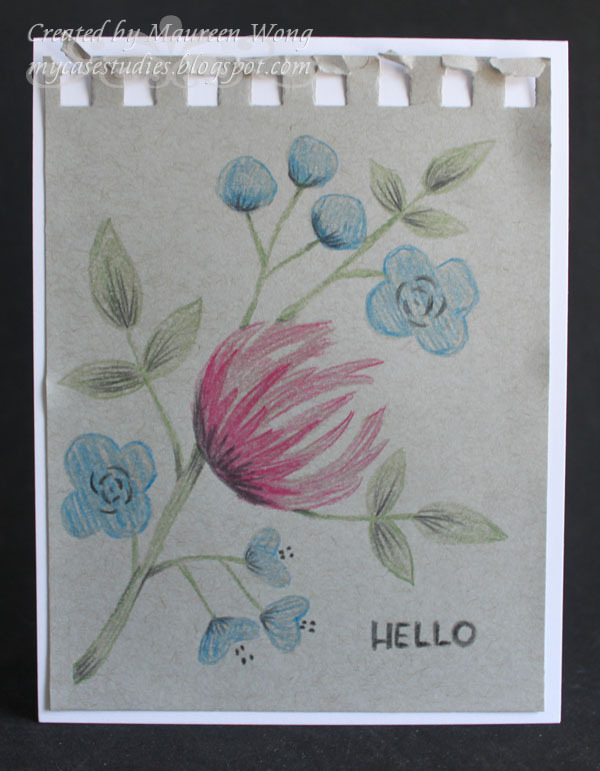 Love the colored pencil coloring, and the tip for coloring with sold stamps? Great card! what a great look. thanks for sharing the technique. I love your watercolored floral beauty Maureen. TFS. How did we ever stamp with our MISTI ? Beautiful card and video. Thanks for sharing so generously. I'd love to win a mini Misti. Thanks for the opportunity to win. Love love love the card and the colors. Hope to win the Mini MISTI!